Brief Description of Subject: Window: This window is one of a pair of windows about St. Francis of Assisi located in a small room on the gospel side of the narthex which is used as a chapel. 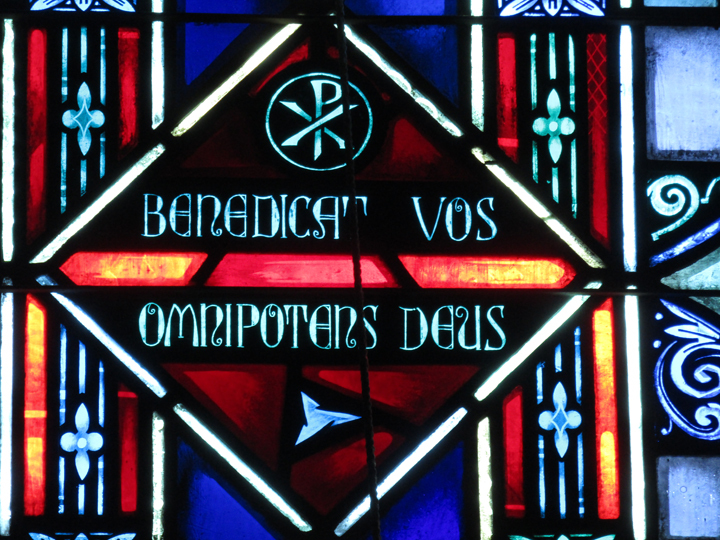 The figurative part of this window is contained in a lens-like shape which shows St. Francis of Assisi, seen with stigmata, giving a blessing to the Patron Saints of the 3rd Order of St. Francis. 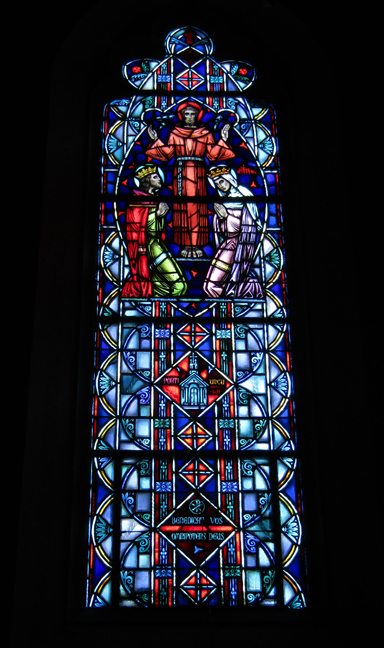 The patron saints are seen kneeling -- on the left is St. Louis IX (King of France) and on the right is St. Elizabeth of Hungary (wife of King Louis IV). 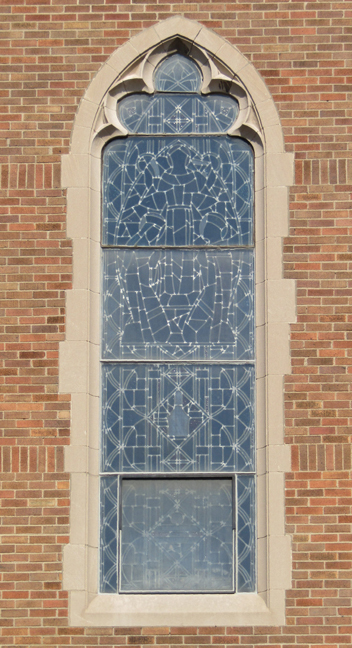 In the diamond shape below is seen the Chapel of St. Mary of the Angels aka Portiuncula. The diamond shape below that contains the Latin words for "May Almighty God Bless You" topped by a Chi-Rho (first 2 letters of the Greek spelling of "Christ). 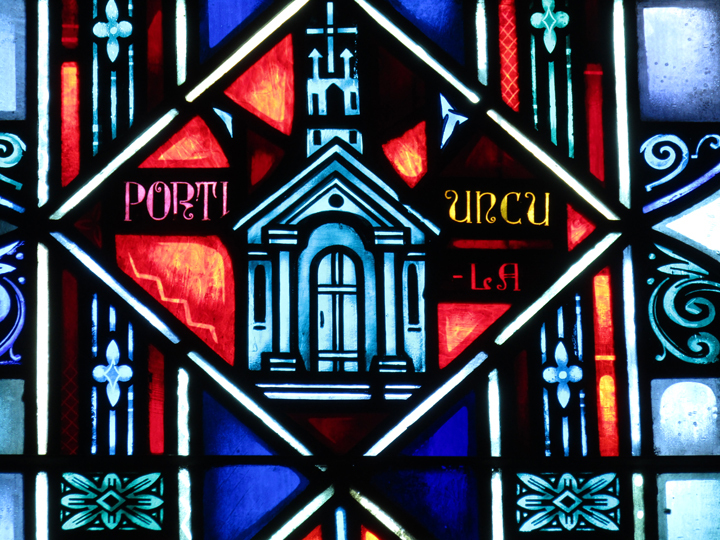 Background: St. Frances (1181 - 1226) renounced all material possession and was directed to repair a small abandoned Chapel called St. Mary of the Angels better known as "Portiuncula" (little portion). He lived in the Chapel and was joined by many followers which led him to found the "Order of Friars Minor" aka "Franciscans". He later founded the "3rd Order of St. Francis". "Third Orders" are men and women who are lay members of a religious order. They do not have to live in the community, they can marry, and they are allowed to wear the habit of the Order. 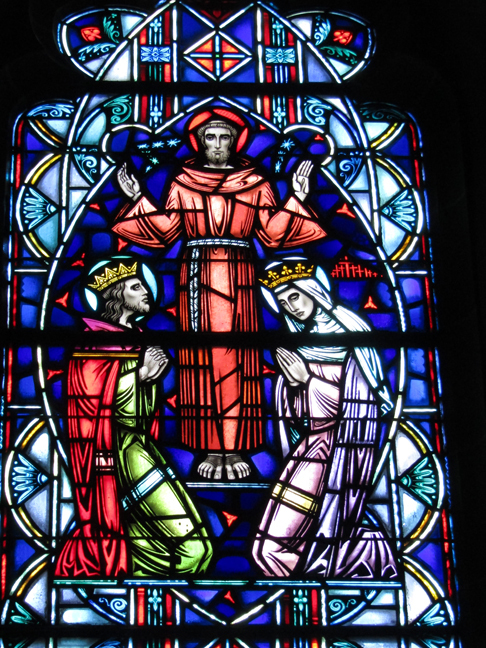 The Third Order of St. Francis has had over 70 members become Saints or Blessed including their patron saints -- St. Louis IX and St. Elizabeth of Hungary. Near the end of his life St. Francis received the stigmata.